The Odyssey Flip Face Putter from Callaway allows players to change the face insert by loosening it (with a provided screwdriver which handily doubles as a divot tool! ), rotating it 180° and retightening. Callaway bills it as an extension of their commitment to club adjustability. The flip moves between the new Metal-X insert to the old standby White Ice surface letting players match their putter to green conditions on any give day. The press release had this undeniably cogent comment. Three models are in stores now. 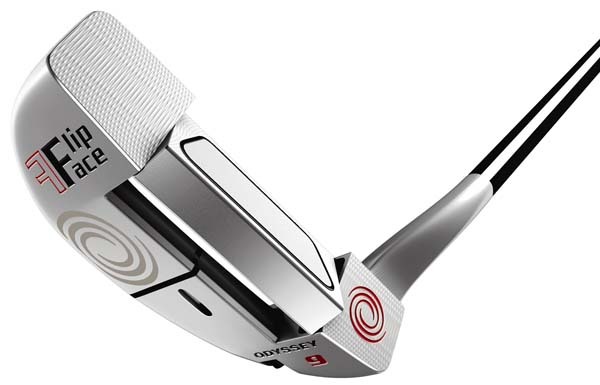 The #1, a rounded heel-toe weighted blade putter with a crank-neck hosel and full-shaft offset; Appleby’s #5, a rounded mallet putter with a single bend shaft and full-shaft offset; and the #9, a toe-weighted, heel-shafted, flanged blade putter with a long hosel and half-shaft offset. Each carries an SRP of $349.